Cancellations will be considered only if the request is made within 1 hour of placing an order. However, if the orders have been communicated to the vendors/merchants and they have initiated the process of shipping them, order cancellation fee at the rate of Rs. 200 for car battery and Rs. 400 for inverter battery/combo per order will be charged. This is applicable only for orders which have been shipped and are cancelled before or at the time of receiving by the customer. No cancellation fee will be charged in case an order is cancelled by BatteryBhai because of non-availability or any other reason. If you placed your order and wish to cancel it, please call our customer care on 0120 4324 000(9:30AM to 7:00PM). You can also email the order cancellation request to [email protected] with your order number, the date of purchase, your full name and address. Because we like to dispatch our products as soon as possible (most of the orders are dispatched within 1 hour of receiving the order), sometimes we may have dispatched your order before you call or email. In that case, order cancellation fee at the rate of Rs. 200 for car battery and Rs. 400 for inverter battery/combo per order will be charged. Why did BatteryBhai cancel my confirmed order? The below given refund policy is only applicable in cases where the buyer has initiated the cancellation before receiving the order. Order is cancelled within 24 hours of placing the order + process of shipping is not initiated = complete refund of item value. Order is cancelled within 24 hours of placing the order + process of shipping is initiated = Rs. 200 for car battery and Rs. 400 for inverter battery/combo cancellation fee would be charged. Order is cancelled after 24 hours of placing the order + process of shipping is not initiated = 2% of item value would be charged (only for online payments). Order is cancelled after 24 hours of placing the order + process of shipping is initiated = Rs. 200 for car battery and Rs. 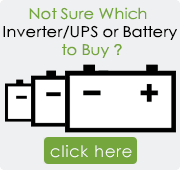 400 for inverter battery/combo cancellation fee + 2% of item value (only for online payments), would be charged. On successful cancellation the refund amount of item value will be credited to you in the form of a credit to your bank account/credit card/net banking within 7 -10 business days in accordance with the respective issuing banks' procedures. As part of the process, BatteryBhai’s finance team would get in touch with you at the earliest possible to provide you with all the necessary details. In some cases the product is updated to different brand or lesser billing price then the original order billing price. Partial refund amount of item value actually delivered will be credited to you in the form of a credit to your bank account/credit card/net banking within 7 -10 business days in accordance with the respective issuing banks' procedures. As part of the process, BatteryBhai’s finance team would get in touch with you at the earliest possible to provide you with all the necessary details.